I know this is meant to be A photo A day, (as in 1 each day!) but I just had to pop this extra one in, because things are cooking here today, and tomorrow is the 1st day of the month, which means it is theme day, so tomorrow will be a BRIDGE picture. The SA Proteas Cricket team played the NZ black caps here today, in fact as I am typing this, the match has just ended, with New Zealand giving South Africa a very decisive hiding! We have a unique cricket ground, it is called the St Georges Oval, after the Park in which it is situated. It has a pretty grandstand, designed by top local architect John Rushmere, and is renowned in South Africa as the only cricket ground which has a resident brass band. The music always adds great atmosphere to the matches here, and it is a small ground, so boundaries are often hit and matches are exciting. Richmond Hill, last Sunday at 4.32 am. The streetlights, floodlights over the park and rising sun combine to create a glowing palette of tones. On the left is Richmond Park, and on the right the Doxa Deo Church (a hideous piece of architecture which we will probably only ever show you as a sillouette against cool views, because buildings this ugly should not be allowed in an old historic area!) The road in between winds down the hill towards the sea (which you can see as the pink strip between the houses, lit up by the rising sun. 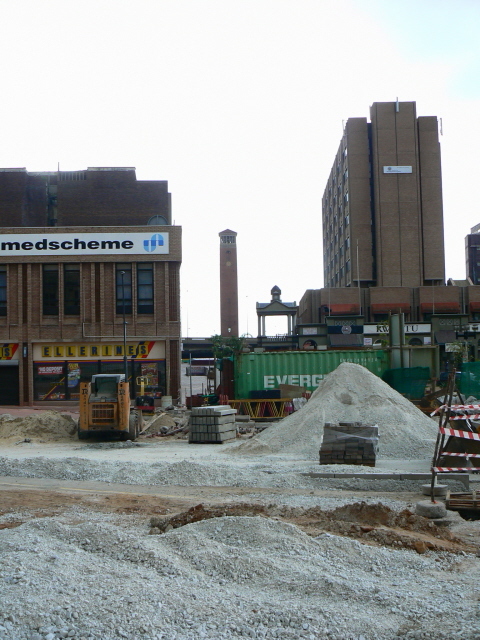 Remember the other day I showed you the Urban Renewal project going on in our City Centre? Well the grand opening is scheduled for tomorrow night, with an evening street festival, live bands etc. This is how it looked when I went to pay our tax (grrrrrrrr) on Friday. With holes in the street, barricades and mess everywhere.... looks like the builders will have to shake a leg to get it ready in time! The pretty old building in the centre, with the domed clock tower, is our City Hall, which was completed in 1861, without the clock tower. The tower was removed from a church further up Main Street and added in 1884. In the old historic Central area of the city, old meets new, as a settlers cottage becomes a hip cafe and jazz club. Previously known as the Lizard Lounge, the metal gates were custom made to suit the theme. 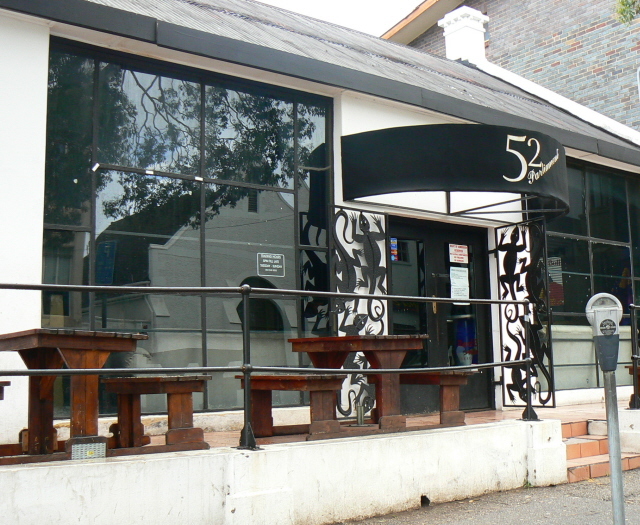 After a change of ownership, it is more boringly known as 52 Parliament Street, but they have luckily been retained! The historic building opposite can be seen reflected in the window. A great move is being made to restore these old buildings, and retain as much of their original character as possible. I love this graffiti, and this one is a real depiction of the vibe now going on inside, some cool Afro-Jazz takes place there. But as you can see, the place is pretty run down. In the past it lived up to its name. It was a Grand Hotel in a wonderful old historic building. Hopefully the move towards urban renewal in this part of town will include restoring this once gracious old lady, without losing the cool new ambience of the Jazz club. With the growth of franchises around the world, it seems that, in many countries, shopping malls have become so similar that, once in them, you could be just about anywhere in the world. This is the Greek Church in Parsons Hill. PE has a close knit Greek community, many of whom keep close ties to the traditions of their motherland, even after several generations here. 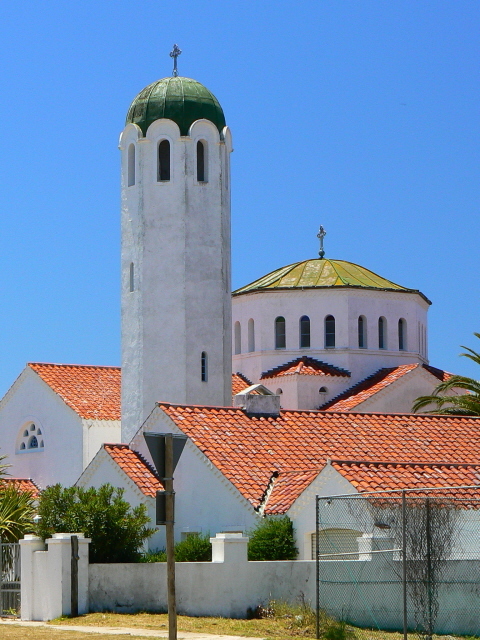 This beautiful complex houses, amongst other things, their church, as well as the Hellenic Hall where functions are held. A flock of pigeons greets the dawn on the roof of the old St Philips Anglican Church in Richmond Hill. This is a view from the rooftop parking at Greenacres Hospital, looking across towards the north west just after sunset. The domed towers are part of The Bridge Shopping Mall, which literally does form a bridge across a major road heading down to the sea. 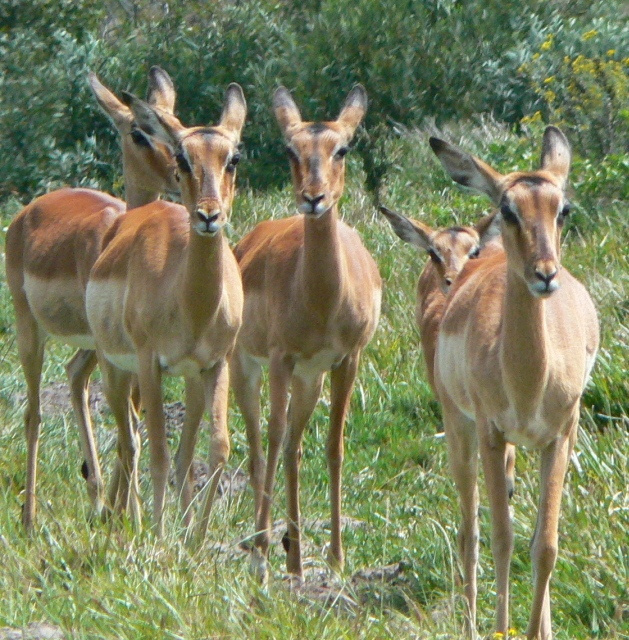 More of the beautiful African wildlife in not-so-wild surroundings, at the Kragga Kamma Game Park. All cities go through cycles of growth and decay, and the centre of Port Elizabeth is no exception. 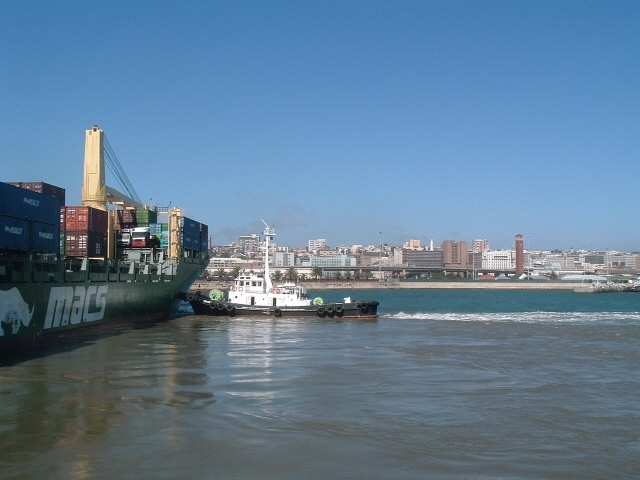 Established in 1820, she grew rapidly and a bit haphazardly at first, to become, by the early 1900s, the South African port with the biggest exports. This was mainly because the diamond industry in Kimberley, and the Ostrich feather and mohair industries were all in their heyday, and used PE to export their goods. But as these waned, she was overtaken by other ports. She became the centre of the South African motor industry, and boomed again for a while, but then fell on hard times in the 70s, when Ford relocated inland. Buildings started looking shabby, crime increased and suburban malls were developed. Decentralisation took place, and the old city centre became a place few residents would visit. This is now changing, we are taking our city centre back from the criminals, and the town council is making serious efforts to rejuvenate the area, by diverting traffic and creating a pedestrian area full of market stalls, sidewalk cafes etc, with strict policing to make criminals unwelcome in the area. I hope this is big enough, it seems these panoramic shots end up a bit small, even when uploading large. I thought I would give you more of an overview of the Boardwalk Casino complex and the manmade lake with floating island. Yesterday at the Boardwalk Casino complex, a jazz festival was held. The complex is built around a man-made lake, and there is a floating "island" on which the various jazz bands played. Around the lake are many restaurants and outdoor cafes, and it was great sitting outside on a perfect summer day, enjoying good food and good music. Port Elizabeth has two satellite towns, Uitenhage and Despatch. Both are about 30 minutes drive inland, and rely heavily on the motor industry. They are both included with PE in the Nelson Mandela Bay Municipality, which runs the metropole. Uitenhage is older than PE by a few years, and has some great old buildings. 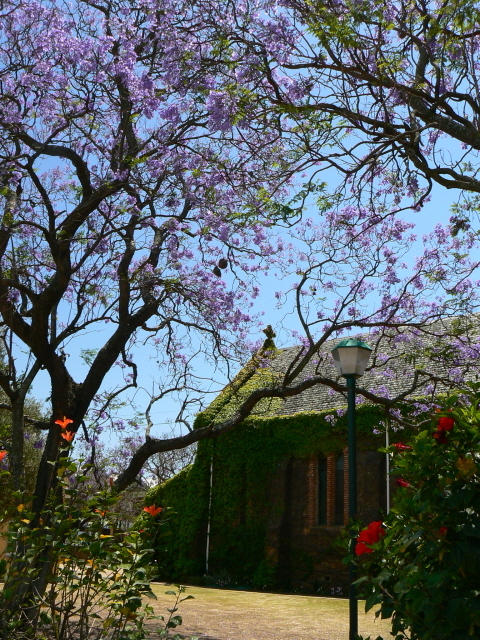 And at this time of year, it also has some glorious Jacaranda trees, which thrive in South Africa, although they are originally from South America. We are extremely lucky to have access to some of Africa's most beautiful wildlife right on our doorstep. 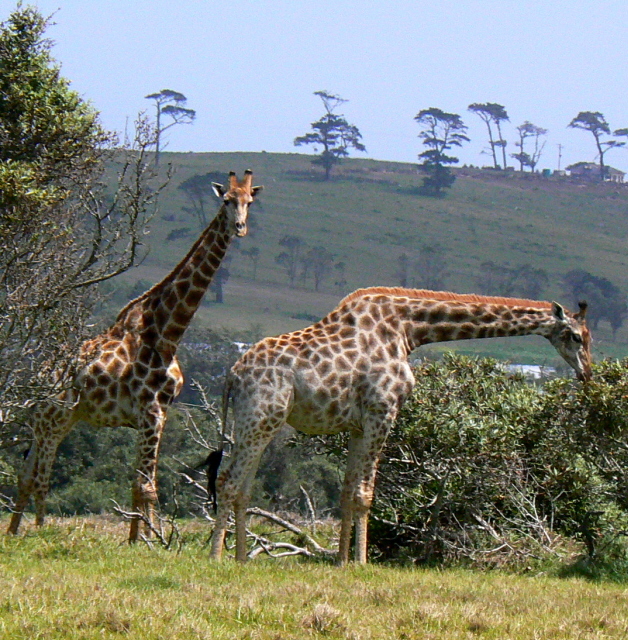 The Kragga Kamma Game Farm lies on the outskirts of the city, in a semi built up area of smallholdings and smaller farms. So we just have to drive 15 mins from the centre of town to be amongst these lovlies... as well as rhino, buffalo, giraffe, zebra, cheetah, and numerous other species. As environmental purists, we find it a little disconcerting seeing them gazing on Kikuyu grass (commonly used for lawns around here) and alien tree species, but it is still great to be able to see them so easily...... and if we want to see them in their natural habitat, the amazing Addo Elephant Park is only an hour away. 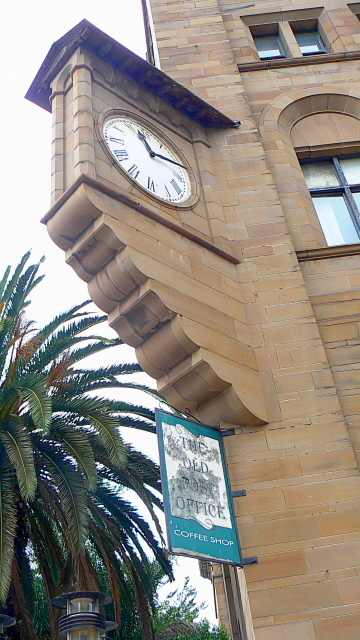 The clock on the old Post Office building. Time has stood still here for a while, and the building is sadly neglected, one of many owned by an Irish property tycoon who has bought up many of the historic gems in Port Elizabeth, and let them go to rack and ruin. It is very sad. Wherever there are good waves there are bound to be surfers. In Port Elizabeth that can either be on the Eastern or Western side of Cape Receife, depending on the wind and the swell. These guys are surfing off the rocks at Noordhoek, on the Western side. Extra care needs to be taken to ensure that one does not come to a sudden stop against a rock, when riding these waves. In the distance, you can see the Cape Receife lighthouse. This treacherous stretch of coastline has claimed many a ship that has tried to sail around the Cape, too close to the shore. 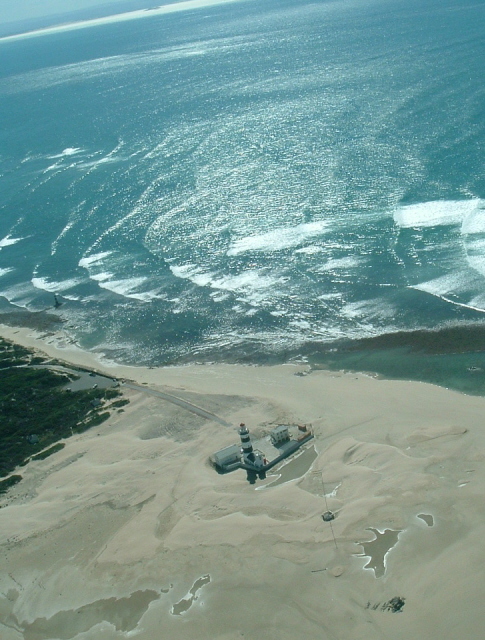 There is a reef, named Thunderbolt Reef, after one of its victims, offshore from the lighthouse. One of the first sights to greet any visitor coming into Port Elizabeth on the N2, from the East, is the Algorax factory, which produces the country's carbon black requirements for the tyre industry. The factory, which is a short walk from New Brighton Beach, is known as Smelly Creek, because the not-too-delightful aroma of the factory is combined with the pungent emissions from the Sewerage Reclaimation Works next to it. This sunset scene gives the factory an altogether different look and quality. I want to thank all of you who have visited this new member of the City DailyPhoto family and made us so welcome. We have wanted to come and return visits since Friday, but had to be out of town for a family celebration, and then this morning Max had a heart attack. He seems to be OK, he is still in intensive care, so please bear with us if we don't get round to visiting or returning comments for a few days. Hopefully normal blogging will be resumed shortly! One of a pair of tugs bringing a large container ship into the Harbour. (I was on the other one, it was cool!) They are amazing vessels, they look tiny here, dwarfed by the ship, but in fact they are not that small, and their propellors are interesting because they are multi-directional. In the background, you can see another famous PE landmark, the campanile, a tall brick tower built in 1920 as the centenary monument to the 1820 Settlers. Since we saw the disused lighthouse yesterday, here is the one that is currently in use, seen from the air during a flight to try and find whales in the bay. (We didn't see them that day, sadly). It was built of stone, in 1851. On the top left you can see the bay as it sweeps around to the East, and from Cape Recife, which is on the point at the end of the bay, the coast continues west towards Capetown. 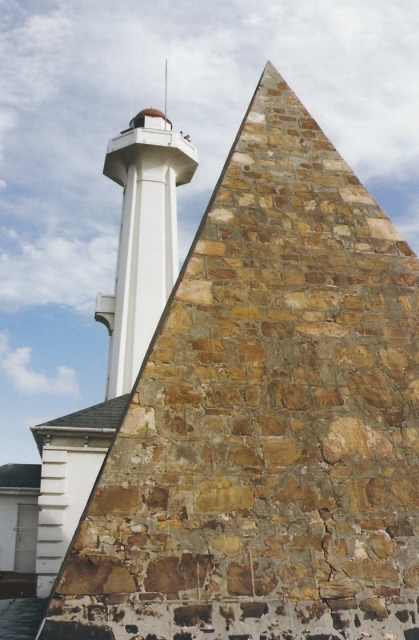 The Donkin Reserve, featuring a lighthouse and a pyramid, is one of the iconic landmarks of PE. The lighthouse is no longer in use, and now houses a military museum. Sir Rufane Donkin, arrived here in 1820 to oversee the settlement of the embryo town, having been en-route for England when he was requested to remain at the Cape as Acting-Governor. The pyramid was built as a monument to Elizabeth Donkin, his late lamented wife who had died while he was in still India, and he was devastated by her loss. He named the town Port Elizabeth in her memory. Welcome to Nelson Mandela Bay! We have been invited by CrazyCow of Durban to participate in the city daily photo forum. Since we are passionate about Port Elizabeth, and already love sharing photos of the city on our personal blogs, it will be a delight to show others around the world what a cool place it is! To set the scene, PE (as it is affectionately called) is a major port in Nelson Mandela Bay, on the Southern coast of South Africa, at about 33.5 degrees south. The bay was known as Algoa Bay since the town was established here in the early 1800s, but the name was recently changed to honour our first President since true democracy. The surrounding area is called the Nelson Mandela Metropole, and encompasses the towns of Port Elizabeth, Despatch and Uitenhage. As they are essentially all one city, we will cover the entire Metropole in this blog, although our main focus will be on Port Elizabeth. Here is a view of the bay, looking across to the north, from the cliffs at the side of Albany Road, which was built in one of the river gorges (we call them kloofs) which run from the hill to the sea. This is a view across the North End area of town, mostly commercial and industrial. The domed roof in the bottom right hand corner is the old fire station, which we will feature in more detail soon. Port Elizabeth is a city in South Africa, situated in the Eastern Cape Province at 33°57′29″S, 25°36′00″E. 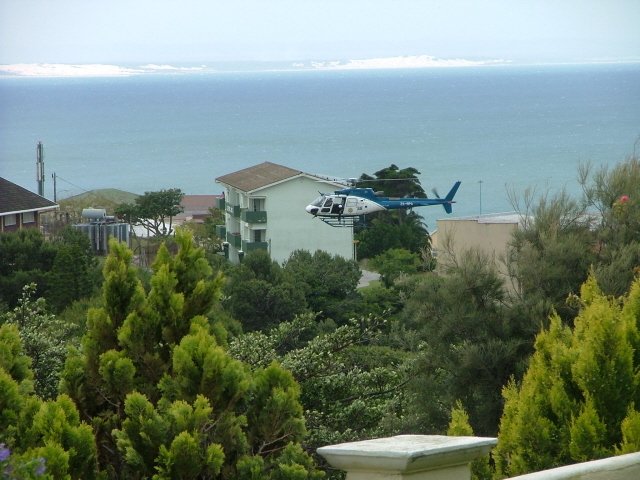 Set along the shores of Algoa Bay, on the south eastern coast of Africa, it is a major tourist destination. The city, often shortened to PE and nicknamed "The Friendly City" or "The Windy City", stretches for 16km along Algoa Bay, and is one of the major seaports in South Africa, midway between the ports of Durban (384 nautical miles N.E.) and Cape Town (423 nautical miles W), and a 9hr drive from Johannesburg. Port Elizabeth was incorporated into the Nelson Mandela Metropolitan Municipality in 2001. With its Neighbouring towns of Uitenhage and Despatch as well as the surrounding areas the Metropolitan Municipality can now add an agricultural sector to their "basket of goodies". The metro has a population of 1.5 million, , making it South Africa's fifth largest city in terms of population and the second largest in terms of area, and is one of five metropolitan areas in SA. The legislative capital of the region is Bisho, 240 km away; Port Elizabeth, however, is considered the economic capital of the region. The city is an important centre for the automobile industry and is a major transport hub; its well equipped airport, harbour and port linking Southern Africa with other national and international destinations. The actual founding of Port Elizabeth dates back to the arrival by sea of 4 000 British Settlers in 1820 to become the first permanent British residents in the country. On 6 June 1820, Sir Rufane Donkin, Acting Governor of the Cape Colony at the time, named the city after his late wife, Elizabeth.